$180.00 Large Naval Ensign in wool bunting, dated 1990. Measuring an impressive 5 ¾' x 3 ¾', this classic Soviet flag was intended for one of the larger warships in Soviet inventory but apparently never saw service due to the collapse of the USSR and consequent decline of the Soviet navy. In very good to excellent condition, with strong colors. $350.00 Order of the Red Banner Naval Flag, in wool bunting, dated 1978. Designates a navy vessel awarded with an Order of the Red Banner. Medium size, approx. 2' x 3'. In outstanding condition. $145.00 Soviet Naval Jack, in wool bunting, dated 1990. Large size, approx. 5 ¾' x 3 ½'. In very good to excellent condition. One of the last flags made for the Soviet Navy just before the collapse of the USSR during the following year. $120.00 Soviet Naval Jack in wool bunting, dated 1989. Medium size, approx. 3' x 2'. A classic Soviet naval flag in outstanding condition. $295.00 Flag of the Chief of Staff the Soviet Navy, in wool bunting, shows very early 1951 date of manufacture. This scarce Stalin era example is noticeably different from the later Soviet flags of the same type. Medium size, slightly over 2' x 3'. In excellent condition. $170.00 Flag of the Chief of Staff the Soviet Navy, dated 1978. Silk version for naval reviews. Large size, approx. 6 3/4' x 4 1/4'. In excellent condition. Uncommon in such a large size. $130.00 Flag of the Chief of Staff the Soviet Navy, dated 1989. Silk version for naval reviews. Medium size, approx. 2' x 3 ¼'. In very good condition. $245.00 Naval Flag of the Chief of General Staff of the Armed Forces of the USSR, dated 1989. In synthetic silk; large size, approx. 5 ½' x 3 ¾ '. An exceptionally rare flag designating that the Chief of Staff was on board. In outstanding condition. $150.00 Flag of the Supreme Commander of the Soviet Navy, dated 1979. In synthetic silk, medium size, about 4 ½' x 3'. In very good condition. 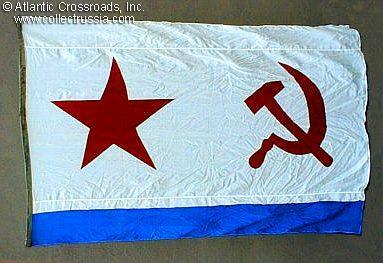 $240.00 Flag of the Supreme Commander of the Soviet Navy, circa 1980s. In synthetic silk. Very large size, about 6 ½' x 4 ¼'. In excellent condition. This very uncommon flag was raised only when the Supreme Commander of the Navy was present onboard the ship. $295.00 Flag of the Supreme Commander of the Soviet Armed Forces, dated 1975. Early silk version for naval reviews. Medium size, approx. 3 1/3' x 2 1/2'. Technically, the highest ranking Soviet naval flag. In excellent condition. This is a transitional version combining characteristics of the earlier and later Soviet naval flags of this type. Extremely rare piece! $395.00 Flag for the USSR Minister of Defense, dated 1984. In wool bunting; very large 6 ½' x 4 ¼' size. A very rare flag, especially its bunting version used for regular sailing including combat missions. Its size makes it appropriate for a relatively large warship, perhaps a destroyer or cruiser. $250.00 Flag of a Naval Fleet Commander ("Three-Star Admiral Flag"), in wool bunting, dated 1985. Easy to display 3' x 2' size. In very good to excellent condition. $195.00 Flag of a Naval Squadron or Flotilla Commander, in wool bunting, dated 1979. A relatively early issue of a Soviet "admiral's" flag, in very good condition. Measures approx. 3' x 2', a convenient size for wall display. $220.00 Flag of a Naval Formation Commander, in wool bunting, dated 1990. Large size, approx. 5 ½' x 3 3/4'. In excellent condition. $80.00 Flag of a Soviet Navy Auxiliary Vessel, dated 1989. In wool bunting, approx. size 3' by 2'. Shows minimal moth damage, in good overall condition. $95.00 Flag of a Soviet Navy Search and Rescue Vessel (aka "Soviet Scuba Divers flag"), in wool bunting, dated 1985. Measures 3' x 2', a convenient size for wall display. An uncommon flag in very good condition, completely free of moth bites. $29.00 Pennant of a Warship Underway (Soviet Navy Commissioning Pennant), circa 1980s. Length 5', width at the base 4 ½ ". In excellent condition. $55.00 Pennant of a Warship Underway (Soviet Navy Commissioning Pennant), dated 1981. Medium sized, approx. 9' long. In very good condition. $39.00 Pennant of a Warship Underway (Soviet Navy Commissioning Pennant), circa 1970s-80s. Measures 12' long, appropriate for a relatively large vessel. In excellent condition. $90.00 Broad Pennant of the Commander of a Large Soviet Naval Unit or Formation, dated 1978. Extremely large size, over 8' long suitable for some of the largest warships. Excellent condition. $85.00 Broad Pennant of the Commander of a Large Soviet Naval Unit or Formation, dated 1985. Large 6 3/4' long size suitable for a larger warship. Near mint condition. $90.00 Naval Broad Pennant of a Senior Vessel at Anchor, dated 1991. Very large size for this type of pennant, over 6.5' long. Nicely marked and in superb condition. $75.00 Naval Broad Pennant of a Senior Vessel at Anchor, dated 1990. Medium size, 4' long. Near mint condition. $95.00 Broad Pennant of a Naval Squadron Commander, dated 1985. Its large 6 3/4' long size makes this pennant suitable for a larger warship. Excellent condition. $70.00 Broad Pennant of a Naval Squadron Commander, dated 1985. Medium size, slightly over 4' long. Near mint condition. $40.00 Soviet Nautical Code Flag for "Foxtrot" (letter F), dated 1991. In wool bunting, very large 3.5' x 4.5' size for a larger vessel. Uncommon Soviet naval / international nautical code flag in fair to good condition. $45.00 Soviet Nautical Code Flag for "Quebec" (letter Q), dated 1991. In wool bunting, very large 3.5' x 4.5' size for a larger vessel. Uncommon Soviet naval / international nautical code flag in good condition. $40.00 Soviet Nautical Code Flag for "November" (letter N), dated 1991. In wool bunting, very large size for a larger vessel. Extremely uncommon naval flag in good condition. $40.00 Soviet 1st Substitute Pennant of the International Nautical Code, in wool bunting, dated 1991. The same pennant also stands for the Russian letter "E" (Est') of the Soviet naval code. Large 5.5' size. In fair to good condition. $25.00 Soviet 1st Substitute Pennant of the International Nautical Code, in wool bunting, dated 1974. The same pennant also stands for the Russian letter "E" (Est') of the Soviet naval code. Small 2' size. Nicely marked and dated on the hoist sleeve. A relatively early flag in good condition. $45.00 Soviet Nautical Code Pennant for Numeral Eight (8), in wool bunting, dated 1991. Huge 9.5' size for a larger vessel. In fair to good condition.